As it has been a tradition since the development of Sea of Thieves became official, the team in charge of the title in Rare has released a new video of the series that has documented the process of creating their next pirate title focused on multiplayer. On this occasion, the developers have presented a video game session that was carried out as part of their Alpha technical period and, among other things, allows us to see the game mechanics and cross-play between platforms. The new Sea of Thieves video, entitled “Pirate Olympics” introduced some members of the game development team in a video game session in which some developers used Xbox One and others used Windows 10. At the beginning, we can see one of the ways in which that we will be able to interact with other boats and their crews because in the first contact we will be able to confirm if they are friendly pirates or enemies. In that sense, Sea of Thieves has the necessary elements to send a symbolic message to those in the open sea, for actions such as lighting a lamp or drawing an accordion for singing a song that may be friendly signals; although you must take into account that it could be a trap. 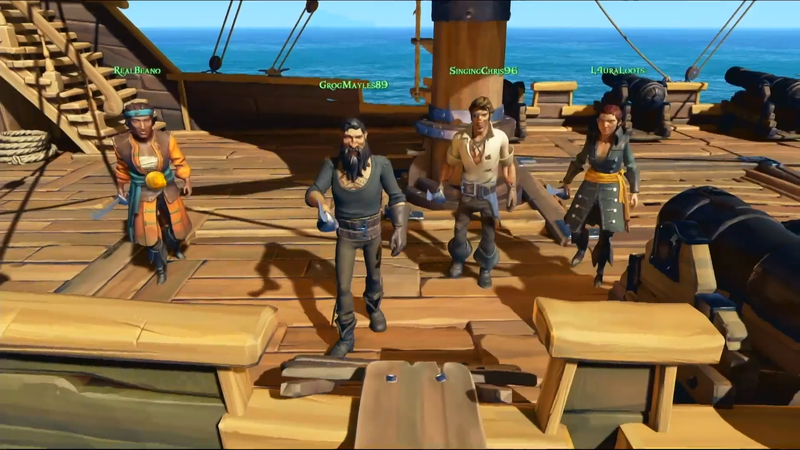 After showing one of the forms of interaction in Sea of Thieves, the development team held a race between boats to show that we can do anything inside the game and organize all kinds of events with specific rules previously agreed with the players we find in line and want to join the activities. Sea of Thieves will arrive in early 2018 for Xbox One and Windows 10. Recently, the studio has confirmed that the title will be able to run even at 540p and 15 fps on PC. Did you like this new video game session? Will you give Rare’s new title a try? Let us know in the comments below.